Many Twitter users are caught in an odd conundrum - between being open to random connections and being open to a glut of unfocused spam-like bot behavior. While I believe the allure of high follower counts has largely been eroded, thanks due in part to the controversial Suggested User List and growth of spam accounts with high connection numbers, many still see higher "value" in the raw numbers of the network. So how does one maintain an open door policy that allows for two way direct messaging all while keeping one's stream clean? the answer is different for everyone, it seems, but I thought I would share some of the ways I am leveraging SocialToo, a service I advise, to improve my Twitter experience. When I first started using Twitter, I enabled autofollow by SocialToo, so I could automatically be connected to people, enable two way direct messaging, and not look disconnected. But as junk followers figured this out, my steam became overwhelmed with direct marketers and news repeaters that didn't add to the conversation. So, while avoiding the option to do a mass unfollowing of all (see a post on that from September), I first turned off the autofollow option and have taken subsequent steps to clean up the results. First Step: Block all direct messages that are spam or for viral games. SocialToo lets me block DMs that contain keywords or search strings like "Mafia Wars". I can either block those DMs outright, or have that person be unfollowed. Second Step: Block all direct messages that are for phishing schemes. SocialToo, once notified of an ongoing scam, blocks all direct messages that match a specified string for all SocialToo users, myself included. This way, even though I use a Mac instead of Windows, I won't even be tempted to click on a fake URL, because I'll never even see it. But even then, I still saw a lot of marketing and garbage in my feed. Preferring not to unfollow everybody and make a mess of things, I started to unfollow junk one by one in my stream, separating the bots from the people. That worked, but it doesn't scale to the thousands of folks who might need 1-1 attention this way. But what I did notice was a pattern. The spammers and repeat Tweeters were almost all using automated tools to generate their dreck, usually from "API" or from TwitterFeed. 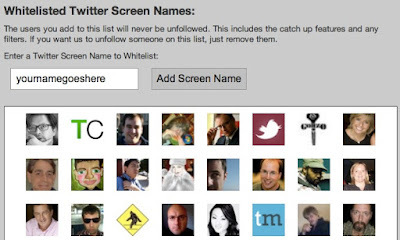 Third Step: Ask SocialToo to unfollow all Twitterfeed or Blip.fm or API bots. I reached out to Jesse and asked him if he could enable SocialToo to automatically unfollow the bots in my stream who I identified were using these tools. In the first two days, more than 1,000 bots were cleaned up, and in the last few months, as I've used this unreleased feature, about 3-4,000 followed have evaporated, leaving me with a still large following count, but a much more relevant count. Yes, there are some legitimate people using Twitterfeed, and so they too got unfollowed, which leads to stage four. Fourth Step: Add people to my SocialToo whitelist to never unfollow. Some of the people I automatically unfollowed noticed and let me know. On other occasions, I found it out myself, and thought that was silly, so I just logged into SocialToo and added them to my whitelist which means no matter the tool they use, they will still be connected. In the few months of reducing the noise on Twitter, I have reduced the people I have been following from almost 15,000 at peak, to just over 10,000 today. I expect that barring my following more groups of people, this week I should drop below 10,000 total and the service will look better and better. I may advise SocialToo, but I do so for reasons just like this. Sometimes issues I find can lead to real product features. And while Jesse hasn't yet rolled out the option to unfollow based on a specific source, he may in the future, and you'll see real benefit. Disclosure: I am an unpaid advisor to SocialToo and have a minor percentage equity stake.